It was some months back that, lost and trying to find my way back on track on my way to work, I stumbled across this New Urbanist development in north Glenview. 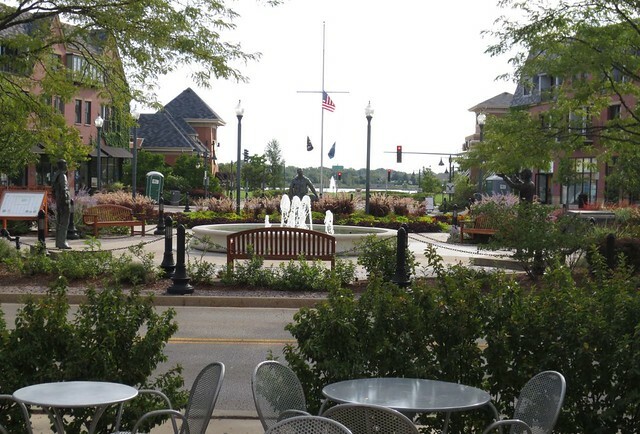 Decent enough stuff, as suburban development goes, with plenty of sidewalks and bike paths, and easy access to the nearby Metra station. But then I came to the center of it all, and my eyes popped out a little bit. 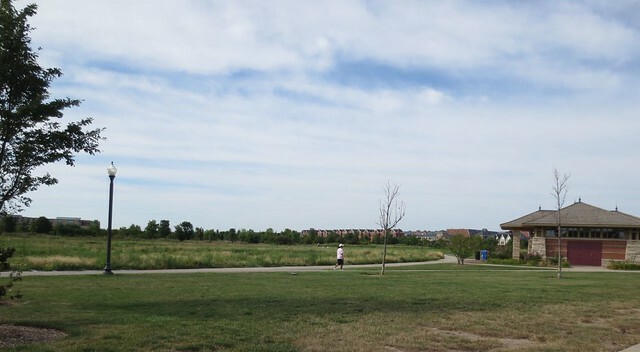 This land, where shops and parking spaces and bike trails and a sizable wilderness preserve and park now dominate, was once a military airport. And the International Style central control tower building has been preserved and adapted as the center piece of the new development. The surviving control tower is a portion of the Hangar One building; hangar sheds once stood behind each of the attached wings. Hangar One was built in 1929, by prolific Chicago architect Andrew Rebori, who also designed an expansion in 1940. As an act of architectural preservation, it’s a remarkable feat. Such a utilitarian building would rarely be considered for preservation, let alone practical adaptive reuse. 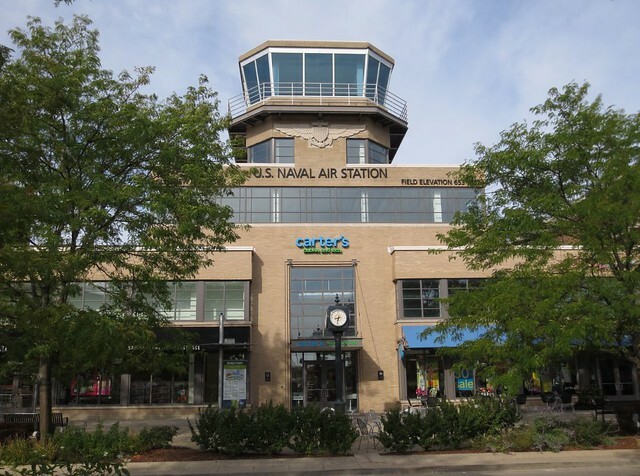 The Navy air base at Glenview dates back to 1929, when it opened as Curtiss Field – intended to be the central hub for Chicago area air travel, and equipped with every modern amenity. It never took off, however; the Great Depression dealt a crippling blow. The Navy first moved in in 1936, and bought the field outright in 1940. With the United States’ entry into World War 2, the base became a major training center for aircraft carrier pilots, and was massively expanded in 1942. 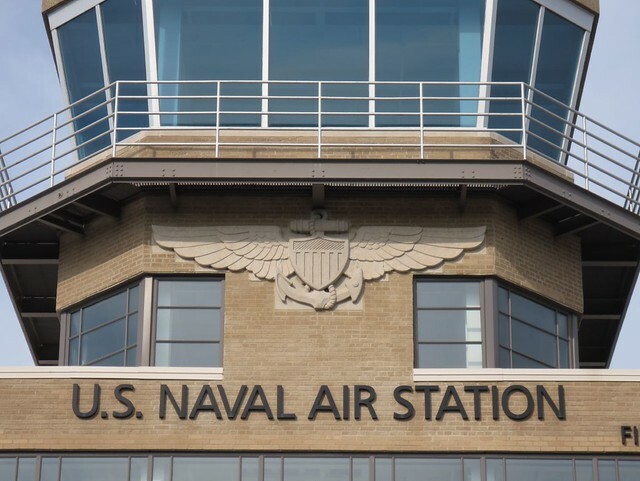 After the war it became a Reservist training center, a location for reserve naval aviators to maintain their skills and training. It also hosted Coast Guard and Marine units over the years, and served as a staging ground for the Chicago Air and Water Show. 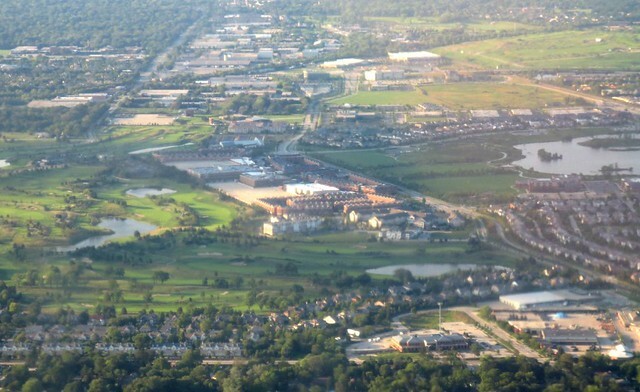 Naval Air Station Glenview was closed in 1995 as part of a post-Cold War reorganization of the military, and the land turned over to the Village of Glenview for redevelopment. 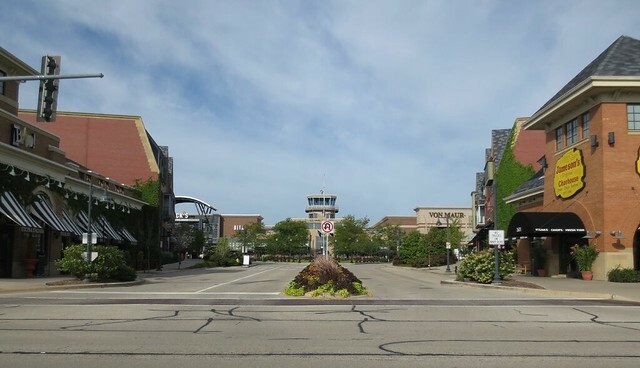 The runways and most buildings were demolished in the late 1990s; in their place rose The Glen Town Center – a collection of shops, businesses, parkland and residences. The project has not been a runaway success in business terms, owing to its somewhat obscure location, but design-wise it beats most of what’s around it hands-down. 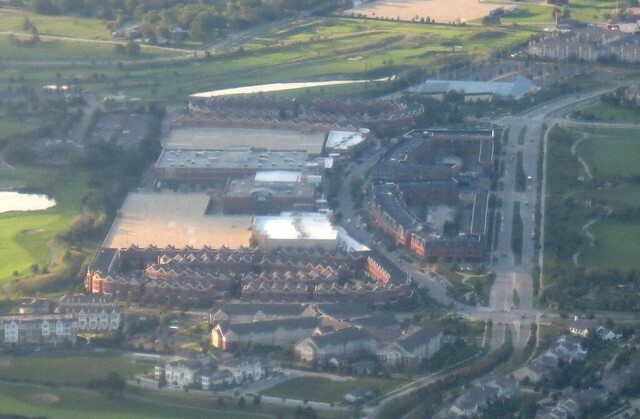 An aerial view shows the two huge garages lurking behind the urbanist facades, where the hangar structures once stood. The base was apparently fully maintained right up to the end – full road maintenance and even a heavy-duty replacement of existing runways. This is, as the site commentator notes, a pretty ridiculous waste of money when you know your base is closing soon. 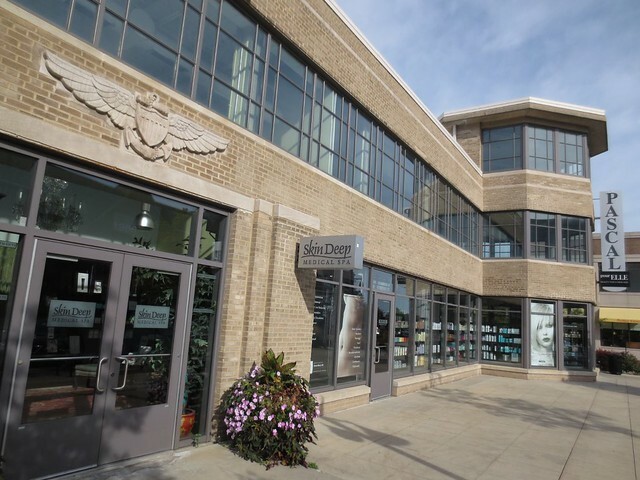 “The Hangar One Foundation, NAS Glenview’s historical agency, had to fight & claw to prevent the entire area from being wiped clean. The village resisted nearly every effort to save historical buildings and grudgingly allowed the tower & HQ building to be saved & the establishment of a museum on site.” This point is rather contradicted by a 1998 Tribune article which repeatedly states that village officials wanted the tower building as the centerpiece of the new development. I don’t find the idea of such resistance hard to believe, though. While the multi-pronged value of the tower building may seem obvious – as a local landmark, as a notable bit of Modernist architecture, and as the most prominent and worthy signifier of the area’s Cold War history – bureaucracy and investment capital abhor anything that’s not shiny and completely new, and the creativity to imagine such a building being repurposed is often lacking. That it did happen is a tribute to those who fought for it. Virtually every other building on the site is gone today, though – all except one hangar, the tower building, and a chapel which was moved a half mile away. “Ironically, the NAS’s existence had created a restricted area for aircraft flying into & out of O’Hare International Airport nearby. 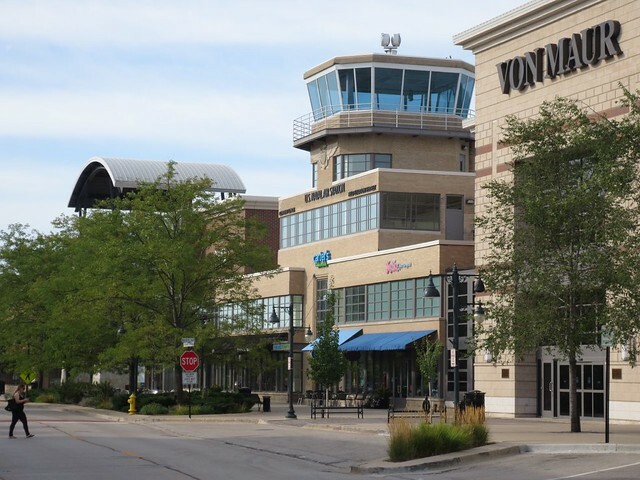 With the NAS gone, O’Hare flights have filled the airspace & Glenview residents are once again complaining about noise abatement.” In development circles, this known as the NIMBY syndrome – Not In My Back Yard. The irony comes when people move in next to something – and then start complaining about it. I saw this a lot in Milwaukee, where neighbors would complain bitterly about all the issues that arose from our adjacency to University of Wisconsin-Milwaukee’s campus – as if they never noticed the university was there, until they’d already bought their house. “As an aviation buff, I mourn the loss of a perfectly good airfield; even more so on 2001-09-11, when I was living in the shadow of the John Hancock Center, and realized that the nearest F-15 was probably an hour away.” I must confess a sharp divergence of opinion with this particular commentator – while I never applaud the waste of existing resources, and it’s dumb to move in next to an air base then start complaining about the noise, a military airfield is not an inherently good use of urban land, and costs a ton of tax money to operate. Speaking as a resident of Chicago, the fewer airplanes over the city, the better. (The lineups approaching O’Hare and Midway are bad enough, not to mention the once-a-year belligerence of the Chicago Air Show – while I love the spectacle, I also can’t help reading a machisimo subtext into it, a bullying assertion that the military could incinerate our city if they so chose. And I am just waiting for the day an F-16 banks too hard and plows into some Edgewater apartment building.) The once-in-a-lifetime events of 9/11 are not enough to justify keeping a military airbase in the middle of Chicagoland’s suburbs – not least because there’s no reason to believe such a base would make a difference in such a scenario.